As part of the ARLIS (Art Library Society) conference that I mention here, two staff members from the Women’s Library, currently part of London Metropolitan University, spoke about two recent projects relating to sport (the theme of the conference was Olympic-based). · Briony Benge Abbot, Curator of Special Collections told us about the current exhibition of called Cycling to Suffrage: The Bicycle and Women’s Rights, 1890-1914 which runs until 8 September 2012. 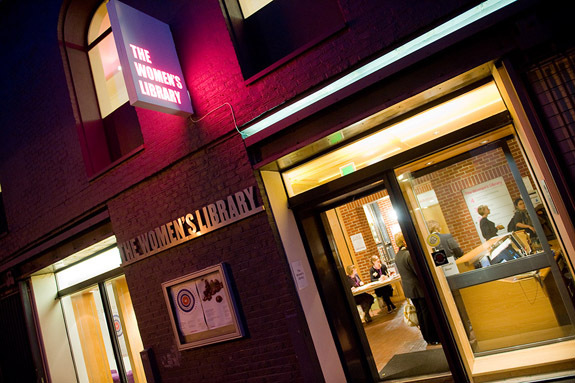 · The Women’s Library was founded in 1926 after the suffragette movement. She gave a brief history of the library, which can be found here. · The main users are researchers, academics, students and family historians. · The library has two exhibition spaces, and aims to show four exhibitions a year. Themes covered in the past have included; prostitution, craft, make-up and work. · The current exhibition looks at the gender politics of cycling in Edwardian and Victorian Britain, a mode of transport that was considered masculine, unsafe and uncivilised for a woman. · The cycle became a symbol of the New Woman, but was also used as a negative symbol against the women’s movement. · The exhibition raises questions about class, “rational dress”, how the bicycle supported the suffrage movement, ie: how it was used in parades, cycling scouts canvassing and handing out leaflets, and its use in pilgrimages and marches. · The research carried out for the exhibition unearthed material that was previously unknown about, such as a radical book about women cyclists, which championed healthy lifestyles and showed women how to fix bikes. · The bicycle was also seen by some to represent a more militant wave of the suffragette movement, following activist activities it was used to get away at high speed, some women were accused of making bombs with bicycle parts, complaints were made about tyre tracks on golf greens etc. · This is the first time this subject has been looked at in any detail, and it has provided new perspectives to parts of the collections and has prompted the rewrite of some catalogue entries. · The outcomes have included talks and the exhibition has enhanced knowledge of the collection. It has also attracted new audiences, including lots of cyclist groups, who discuss how cycling is still a gendered issue. Only 29% of cyclists in London are women, and the death rate from accidents is highly disproportionate. · More about the exhibition here. I visited it briefly the other day, and it’s really illuminating and worth a visit. · Tracey Weller Learning Coordinator, whom I had already had the pleasure of meeting to interview for my dissertation, told us about some of the outreach they did at the Women’s Library, specifically about the Muslim women in sport project. · This was a community-led research project, originally with 12 or 13 young Muslim women looking at Muslim women’s participation from 1948 to the present day. By the end of the project, there were four women taking part, this reduction in numbers is fairly standard in community outreach work. · The project was funded primarily by HLF, followed by contributions from ESRC and the People’s Record. · The participants were given an introduction to the Women’s Library, and had a workshop about using a research library. They received training around oral histories and interviewing techniques, and film-making skills. · The collection of material relating to Muslim women in sport was quite patchy in the late 18th and early 19th century, but there was more relevant stuff from more contemporary times. · Issues raised involved class, ethnicity, over-representation of materials related to rowing and hockey, clothing- especially for Muslim sportswomen. · They discovered that Muslim women were amongst the most enthusiastic in women’s boxing. · The last Olympic sports to exclude men are rhythmic gymnastics and synchronised swimming. · They filmed and edited their own short film about their research, which can be found here. · The outcomes of the project were: the participants acquired new skills, such as research skills and filming skills. The film preserves their research and became part of the collection, they have helped to highlight a hidden voice and have raised the profile of Muslim women’s participation in sports. The project has also enhanced the knowledge of the Women’s Library staff of their collections. Recently the Women’s Library have announced that there are seven bidders for alternative ownership, which I’m sure you will have heard about, there is a shortlist of seven, and I’m selfishly hoping it will stay in London, and particularly keeping my fingers crossed for Senate House as it would be a brilliant edition to the already blooming University of London (again, obvious bias on my part).